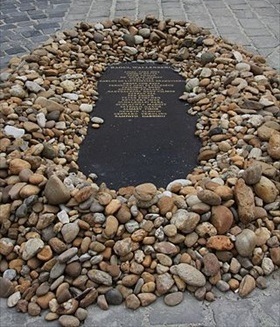 On this date in 1944 Raoul Wallenberg, a 31-year-old bache­lor from a distin­guished Swedish family, arrived in Buda­pest, capital of Nazi-occupied Hungary. With diplo­matic accredi­ta­tion from the Swedish Minis­try of Foreign Affairs (Sweden was a neu­tral nation), Wallen­berg had been secretly recruited by the recently created (Janu­ary 22, 1944) U.S. War Refugee Board to rescue Hun­gar­ian Jews by either trans­porting them out of Hungary or estab­lishing havens of temporary refuge for them inside the country. Wallenberg arrived in Hungary when depor­ta­tions of Jews were well under way. In just six week in the summer of 1944 over 450,000 Hun­gar­ian Jews were fed into Auschwitz-Birkenau’s gas chambers and crema­toria in Nazi-occupied Poland, and only an esti­mated 250,000 remained in the coun­try, chiefly in the capital. Sweden’s special envoy imme­di­ately set about printing and distri­bu­ting thou­sands of certi­fi­cates of protec­tion (Schutz­paesse in German; see example below) to as many of the sur­vi­vors as he could find, thus pre­venting their depor­ta­tion and inevi­table murder. Using WRB and Swedish funds, Wallen­berg rented over 30 buildings, there­by lending the buildings extra­ter­ri­torial status pro­tected by diplo­matic immunity. Roughly 10,000 persons found shelter in these “safe houses.” At its height Wallen­berg’s network employed 350 people, mainly Hun­ga­rians mixed with Swedes, a few diplo­mats from neutral Switzer­land, Por­tu­gal, Spain, and the Vatican, and some anti-fascist Hun­ga­r­ians who liaised with Britain’s secret espi­o­nage organization, the Special Operations Executive. The fearless Swede put his life on the line multi­ple times. Eich­mann denounced Wallen­berg’s “abuse of the safe con­ducts” the Swedish “Jew-lover” liberally distrib­uted. One day early in Novem­ber 1944 Wallen­berg inter­ceded with SS guards to save perhaps 200 Jews who held Swedish Schutz­paesse, slipping a few more to people when the guards weren’t looking. Most famously, on Novem­ber 23, 1944, in Eich­mann’s presence Wallen­berg delayed the depar­ture of a train­load of Jews stopped at the Hunga­rian-Austrian border, ignoring the fixed bayonets Arrow Cross (Hunga­rian Nazis) guards pointed at his chest, and handed out “replace­ment” Schutz­paesse to as many people on the plat­form as he could. In short order he had lined up 300 Jews, who clambered into cars and trucks in a convoy he led back to Budapest. Accorded the honor of “Righteous Among the Nations” by Israel’s Yad Vashem as well as Israeli citizen­ship in 1986, Wallen­berg—some­times called the “Swedish Schindler”—is widely cele­brated for saving tens of thou­sands of Hun­gary’s Jews. Oddly, Sweden’s govern­ment turned a blind eye and deaf ear after Wallen­berg was reported taken into custody and placed in deten­tion by Soviet intel­li­gence oper­a­tives during the Red Army’s offen­sive against the Wehr­macht in January 1945. Seventy-one years after his disappear­ance, Sweden issued his death certi­fi­cate after repeated requests by Wallenberg’s family. 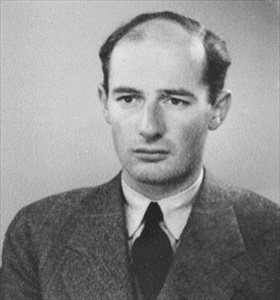 Holocaust Hero Rauol Wallenberg, 1912–1947? Left: Swedish aristocrat, businessman, diplomat, and humani­tarian Raoul Wallen­berg (1912–1947?) is widely honored for his success­ful efforts to rescue tens of thou­sands to as many as one hun­dred thou­sand Jews from Hungarian Arrow Cross fascists and the Nazis in German-occupied Hun­gary during the later stages of the war. While serving in his offi­cial capa­city as secre­tary to the Royal Swedish Embassy in Buda­pest between July and December 1944, Wallen­berg, who was one-sixteenth Jewish, issued thou­sands of certi­fi­cates of protec­tion (Schutz­paesse), some­times called protec­tive pass­ports. The blue-and-yellow certi­fi­cates embossed with the three-crown royal emblem signi­fied that the bearers were under the official protec­tion of the Swedish Embassy and there­fore could not be deported to death camps such as Auschwitz. (The Swiss, too, had their own ver­sion of the Schutz­pass). At the height of the Soviet siege of Budapest on Janu­ary 17, 1945, Wallen­berg disappeared during a visit to Red Army head­quarters. He was later reported to have died in Moscow’s Lubyanka prison on July 17, 1947, while impri­soned by the Soviet secret police. The motives behind Wallen­berg’s arrest, deten­tion, and probable execu­tion, along with questions surrounding his ties to the U.S. Office of Stra­tegic Ser­vices (a war­time intel­li­gence agency of the United States) and Hungary’s anti-fascist opposition, remain murky. 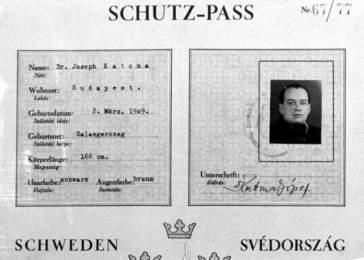 Right: Swedish Schutzpass issued to Rabbi József (Joseph) Katona, the Chief Rabbi of the Dohány Street Syna­gogue (Great Syna­gogue), dated Buda­pest, Hun­gary, Septem­ber 15, 1944. Rabbi Katona sur­vived the war along with more than 100,000 Hun­garian Jews—mostly owing to the efforts of Wallen­berg, his diplo­matic col­leagues, and hundreds of “protected Jews,” who together estab­lished sanc­tu­aries, hos­pi­tals staffed by dozens of volun­teer nurses and doctors, schools, nurs­eries, orphan­ages, and soup kitchens in a so-called “inter­national ghetto” for Jews holding Swedish and other protective passes and forged documents. Left: Hungary named Wallenberg an honorary citizen in 2003. Several Hun­garian sites honor him, including this one in the Raoul Wallen­berg Memo­rial Park at the Dohány Street Syna­gogue in the center of Buda­pest. A joint second­ary and voca­tional school located several miles from the Dohány Street Syna­gogue is named after him. 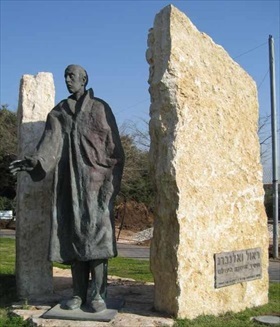 Right: The statue of Raoul Wallenberg on Wallenberg St., Tel Aviv, Israel, is iden­ti­cal to the one in Buda­pest. At least five streets in Israel are named after Wallen­berg. Israel granted Wallen­berg honorary citizen­ship in 1986 and honored him, as it did German indus­tri­alist Oskar Schindler, at the Yad Vashem memo­rial in Jeru­salem as one of the Right­eous Among the Nations, a desig­na­tion that recog­nizes Gen­tiles who saved Jews during the Holo­caust (Shoah in Hebrew). The U.S. Congress made Wallen­berg an Honorary Citizen of the United States in 1981, the second person after Winston Chur­chill to be so honored. The portion of the street on which the U.S. Holo­caust Memorial Museum is located was renamed in his honor.